Col Carol P. Welsch arrived at Kirtland AFB from Los Angeles AFB, where she served as the Director of Engineering, Space Superiority Systems Wing (SYSW), Space and Missile Systems Center. As the SYSW Director of Engineering, she was responsible for systems engineering, technology development, and development planning of a $4B space control enterprise including space situational awareness and counterspace systems. Col. Welsch graduated from Rensselaer Polytechnic Institute in 1988 with a Bachelor of Science in aeronautical engineering and completed Rensselaers Air Force ROTC program as a distinguished graduate. Col. Welschs career includes a diverse set of assignments as an engineer in the space acquisition, space operations, cruise missile flight test, and strategic intelligence fields. Col Welsch temporarily left the engineering field to serve as an Air Force Legislative Fellow to the Office of Senator Wayne Allard. As a member of Senator Allards staff, she was responsible for all homeland security issues and assisted on military and space legislative issues. She followed this fellowship with assignments to the Air Staff Directorate of Space Operations and the Office of Legislative Liaison, where she served as the Secretary of the Air Forces focal point for all Air Force space legislative issues. Col Welsch previously served as the Director of the Space Development Group, and is a graduate of the Air War College at Maxwell AFB, Alabama. Karl Fuchs joined iDirect Government Technologies (iGT) in 2004 as the Director of Engineering, just as the satellite-based IP communications company was expanding its very small aperture satellite (VSAT) market presence into the federal government and international Internet Protocol (IP) networking world. He now works as the Vice President of Engineering. As Vice President of Engineering, Fuchs leads iGTs team of federal systems engineers and serves as chief architect for new product integration. Fuchs has more than 20 years of experience in the areas of technology and the federal government. Prior to joining iGT, Fuchs was Director of Systems Engineering at Nortel Networks, where he oversaw the Verizon account team of systems engineers, leading the design of IP, Frame Relay, Asynchronous Transfer Mode (ATM) and dense wavelength division multiplexing (DWDM) networks. Before joining Nortel, he designed IP and ATM networks for Sprint and the federal government. Mr. Robert Tipton (Tip) Osterthaler joined the SES family in December 2006 when he became the President and CEO of AMERICOM Government Services. Since then, the independent corporation and wholly-owned subsidiary of SES WORLD SKIES has grown and integrated with other USG business elements within SES to become SES WORLD SKIES, U.S. Government Solutions. During his tenure at SES, the U.S. Government business transformed from a product oriented sales channel into an end-to-end satellite solutions company, and now to an entity that is directly aligned with the global assets and resources available on the SES fleet of 44 communications satellites. Focus... Warfighter-On-The-Move, author: Bhumika Bakshi, C-COM Satellite Sytems, Inc.
Providing mobile warfighters with broadband communications over satellite is an uphill battle as military forces must establish tactical networks that connect hundreds of remote locations quickly and under the most stressful of conditions. Communications technologies for the global warfighter are developed and fielded based on military requirements. If the last decade has taught us anything, it is that war is unpredictable and the fight can move anywhere  the tactical edge is expansive and ever-moving, requiring communications solutions that adapt to constantly changing requirements. Encompass Digital Media, which operates two of the largest, independent transmission facilities in the U.S. in Los Angeles and Atlanta, has built a reputation among military and civilian clients for its reliable performance during emergency response operations. Incoming!  This is not the kind of cry that a loving wife expects to hear in the background whilst talking to her husband on the telephone. But when Danish Army Sergeant First Class, Flemming Ulrich thought he would check in with his family at home using his Explorer 500, he was not expecting it to start raining rockets. Fortunately, Flemming and his unit made it through the barrage unscathed and he was soon able to call his wife back and let her know they were all safe. Full Motion Video (FMV) captured by Unmanned Aerial Systems (UAS), ground mobile platforms, and fixed persistent surveillance systems is emerging as a very powerful weapon in the arsenal of remote sensing. Harris is providing the Intelligence Community and their customers with the capability to harness that power into an intelligence resource for advanced processing, exploitation, and dissemination. At the core of these capabilities is our Full Motion Video Asset Management Engine (FAME), a COTS-based solution developed from decades of experience in the commercial broadcast industry. FAME is a video ingestion, management, and distribution architecture that provides the infrastructure for improving the way that video and other sources are ingested, cataloged, retrieved, and distributed. FAME integrates proven COTS products and practices from Harris commercial broadcast business with the image processing, system integration, and security expertise we provide to our government customers. 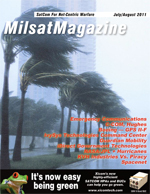 On April 8, 2010, news broke that the worlds largest provider of fixed satellite services, Intelsat S.A., lost contact with one of its approximately 50 geosynchronous satellites, Galaxy 15. More important, the satellites receiver and transmitter equipment was still functioning as it started to drift eastwards from its location in the geosynchronous (GEO) belt. Quickly dubbed zombiesat by the media, this combination of uncontrolled drifting while still having an active communications payload meant that Galaxy 15 posed a serious concern to other satellite operations in the region of the GEO belt, as it has the capacity to interfere with other satellites operations. During the late sixties and early seventies the U.S. Air Force launched a series of satellites in what was known as the Orbiting Vehicle (OV) series. The satellites were essentially of a scientific and technology nature and demonstrated the use of a standard platform. The series came in five sub-series. While Chinas 2007 anti-satellite (ASAT) test and its missile defense intercept test earlier this year have attracted much attention and concern, another emerging space power has also been expressing its interest in developing those capabilities yet attracting very little notice: India.